Editor’s Comment: During his war service Tom had been through some difficult periods up to this point, but this Turkish front was arguably Tom’s most difficult. Aug 5, 1918 Drying ourselves a little. Very nice morning. Arrive at Baku. A glorious sight to see some good stone houses again and some decent people. March through the town headed by the band. People cheering us. Go to the Hotel Metropole and sleep on top of the roof. Very nice climate here. Aug 6, 1918 Have a look round Baku. Visit a few cafes and find the price of stuff very dear. Cup of Cocoa 7 roubles 14/7 Bread Black 23/- per lb. Ice Cream 16/- a time etc., and not hearing very good news of our position in a besieged town, spend all we have whilst we are able. Aug 7, 1918 Preparing for the ‘line’. Working all night. Still feeling bad and finding the black bread here sour and dirty. Mount gun at door of hotel as we hear there is a strong party against us even in the town. Aug 9, 1918 Go up to front in Vauxhall car with guns etc. Bolton is killed and Henn is wounded in face. Aug 13, 1918 Leave for front line on the right flank. Joe leaves me with his crew for left flank. Mine and two other gun crews leave at 2 a.m. & walk with all firing equipment to ‘line’. Mount gun in an open space between some Russians & Armenians and work hard, making as much protection for ourselves as possible before dawn. When daylight comes and we can see whereabouts we are, find that there are no trenches. Russians can be seen on either side of us. There is one about every four yards and each has a small mound of earth to protect himself. Our three crews on this sector are about one hundred yards apart. As we could not dig down very well before daylight have to ‘lie low’ all day. I decide to commence work again as soon as dark comes and dig a square hole where we can sit in. There are three other fellows with me forming the ‘gun crew’. Two have gone in hospital, as there were five. I feel very bad and weak. Aug 14, 1918 Digging until dawn. Ground very rocky but manage to get low enough to sit down. Light a fire in our hole to boil water to make tea. Nearly smoke ourselves out. Toast some black bread on the ashes to try and dry it a little and call it ‘breakfast’. Russian and Turks all have small fires going to do some cooking. We ‘find’ and old pot and boil some rice in it for dinner. The Turks have rumbled that there are British about and make us keep well down. They have seen our sun helmets. Baku in other words means ‘windy’ and well we know it, for there is a strong wind all day and as there is nothing but dust all over the country we are in, are hardly able to keep our eyes open when thick dust clouds blow over. Our poor rice gets its share of dust. Terribly hot day and we all feel exhausted being in the heat of the sun all the time. Try to go to sleep with one on guard but the flies won’t let us. When dark comes one of the fellows, an old soldier from Africa, goes to look for wood and water. We have some stew brought to us from a Russian cook house, two miles away. Our usual rations are tea sugar, (have not seen any milk since I left Mesop) rice, dried fruit, black bread (proper army quality, with plenty of dirt in to make up the weight) and occasionally some tins of fish and tomatoes, Russian manufacture, and some stew at night. Washing or shaving is quite out of the question. Aug 15, 1918 As usual guard all night. Make tea for breakfast with the usual bread and a very small portion of fish stuff each. Boil some rice and fruit together in our pot for dinner and make some more tea as we are all terribly hot and thirsty but cannot drink the water without first boiling. Tea (less milk of course) for tea and wait for the stew to come when dark. Aug 16, 1918 A relief party comes and we are able to go back to Chorny Gorod, a place about three miles away and have a clean up. Russians bring in six prisoners, some civilian, take all they can from them and put them in a room and then shoot them, afterwards making sure they are all dead by bayoneting them, throw the bodies in a well near by. Aug 17, 1918 At midnight leave for line again, still feeling bad. Aug 18, 1918 Advance a little and consequently have to dig another gun implacement. Our ‘old soldier’ the cook does not forget the old tin for tea and the pot. We are now near an old garden and get a few green tomatoes which are boiled for dinner. Black Bread and che (Russian tea) for breakfast and tea. Aug 21, 1918 In a new advanced position, can often see the Turks. As we have not had time to dig ourselves in, have to lie down in the heat of the sun all day. 14 hours of sunshine and not able to cook anything. Just have bread and water all day. Feel quite done up, but have to work all night. Aug 23, 1918 At rest house again. Get some blankets and look forward to a good night of sleep, but no hope of taking any clothes off, except hat. Have two hours rest and then are all turned out as the Russians are retreating. Pouring with rain loading up ammunition. Aug 25, 1918 Mail arrives. Kill sheep and keep several good pieces to take up the line again. At 9 pm leave for trenches again. Aug 26, 1918 Turks attack on left flank. Heavy losses for the Staffords and ourselves. Aug 27, 1918 Hear that Russians have now filled our famous well with bodies and started another, but I am not there to see the performance this time. Aug 29, 1918 Still in our hole, feeling very bad. Try going without food all day to see if that will help me. Aug 30, 1918 Still bad , eat only one slice of black bread with a little fish and tomato on all day. 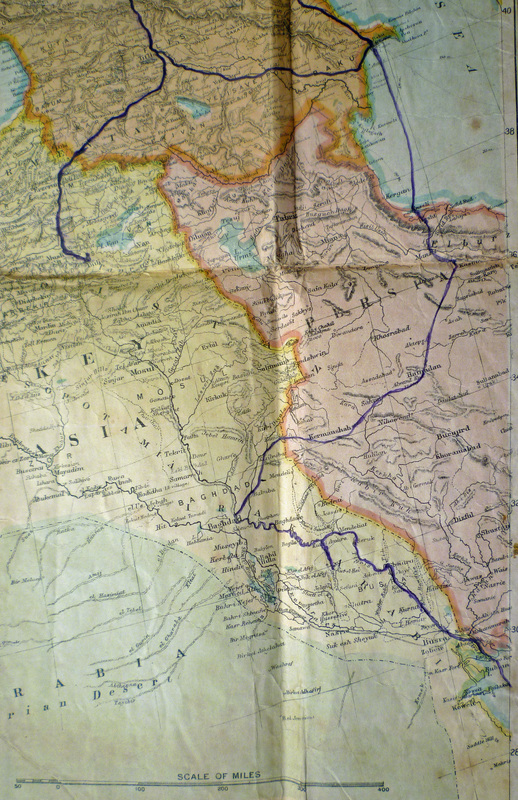 Aug 31, 1918 To Baku by car. Get some money and buy myself a fried steak and potatoes costing 30 rouble (pre war equivalent £3 2s 6d). Spend the remainder on cakes and sweets in case I do not get another chance, and go back to the line. Turks again attack, lose machine guns and many of our fellows. Up all night, preparing for retreat. Turks about twenty to one. What fellows we have still in the line are nearly all very bad and mostly like skeletons. Sept 1, 1918 Feel bad and very weak. Retreating again. Sept 2, 1918 In another gun implacement. Bread and che only to eat. Sept 10, 1918 Digging a new gun postion very fed up. Camel to eat in stew. Sept 12, 1918 To Baku again to buy something worth eating. Sept 14, 1918 Big Turkish attack. Lose lots more fellows and have to retreat right into Baku. Joe is wounded. Sept 15, 1918 2 am Marching towards the quay at Baku. Bullets flying all over the place. People crying and locking themselves in their houses. Smash up all our cars and go on board a boat with just our guns. Nothing to eat on board but bread and & che. Standing room only. Everyone half dead with exhaustion. Sept 16, 1918 Safely out. Arrive at Persian port of Enzeli. Clean ourselves up a little and buy some cake and biscuit stuff, off the Persians. Sept 17, 1918 Feeling a little more at ease in mind. Get some Persian money and buy some eggs and fish. Feel very weak, cannot walk very far. Sept 18, 1918 Forming a Mess for Staff Sergts and Sergt Majors. Live in a place with a zinc roof and feel very glad to be under something waterproof. Draw a good amount of money and all club together to buy some decent food. There are about twelve of us and we have a cook for the mess. I still am very bad. Sept 19, 1918 Splendid food , but I am not well enough to enjoy it. Che and biscuits at 5.30 am. Parade at 6 am until 7.30. Fresh fish for breakfast at 8 am. Parade 9 until 12. Dinner Roast Mutton or fry. Fruit and custard . Cake. Parade 2 pm. Tea Fish and chips etc. Supper cocoa and biscuits and cake. Sept 20, 1918 Hospital here is full up with wounded and sick. Losing men every day. I get permission to lie in bed (on the floor) all day without going to hospital. Two of the fellows try looking after me and give me the proper diet for dysentery, that is practically nothing but milk. We can now buy milk (goats) from the Persians. Sept 21, 1918 Mail arrives. Have some Allenbury’s Diet two or three times a day. Sept 22, 1918 Manage to get up for a little while. There are always Persians hanging about waiting to do something for us in order to get a little to eat. Sept 30, 1918 Have a bathe in the Caspian and go into Enjeli to have a look round the bazaars. Living on eggs, milk, rice and Allenbury’s. Oct 4, 1918 Leave Enjeli on a Peerless lorry. Oct 5, 1918 Arrive at Resht. Oct 6, 1918 Another night in Mendgil. Oct 7, 1918 At Kasbin. See Joe again who is just recovering from his wound. Still feeling bad but take a walk into the vineyards. Oct 9, 1918 On the lorry again. Get a good shaking up. Arrive at Hamadan. Very cold night and hot during the day. Oct 12, 1918 Arrive at Kermunshak. Oct 13, 1918 Still on lorry with about twenty others aboard. The car in front of us runs over two children and kills them. Oct 14, 1918 Go down Piatak Pass and notice the climate now much warmer both day and night. Arrive at Ruz. Oct 18, 1918 See the date palms again, arrive at Baghdad and go to a place outside called Kasimain. Oct 19, 1918 Just beginning to feel a little better. Oct 23, 1918 Making ourselves comfortable in an old Turkish Hotel. Feeling much better. Oct 26, 1918 All our corps is now collecting here. Joe and I have a small room to ourselves. Making a bed out of date sticks. Fitting up shelves in the room and stick some pictures up to make the place look more comfortable. Oct 28, 1918 Out with armoured cars. Oct 30, 1918 Having a very good time. Feeling quite well again. Nov 11, 1918 Hear of Peace.